Disk Space Analyzer helps you to view at a glance all the folders, files inside them and the space occupied by them on your system. This utility is an important tool with which you can organize your data and can easily view the data on your disk. 1.The Second Line Button: quick access button to Analyze, Back, Explorer, Command Prompt, Properties and Delete on the selected files. 2.The Upper Box: allows you to analyze the disk by Files and Folder, Extension and other types, including Videos, Compressed and Musics, and shows File Name, File Size, Percentage, Location and other information here. 3.The Lower Box: displays the analyzed disks with some information, such as disk capacity, free space size and used space percentage, analyzed file and folder amounts. 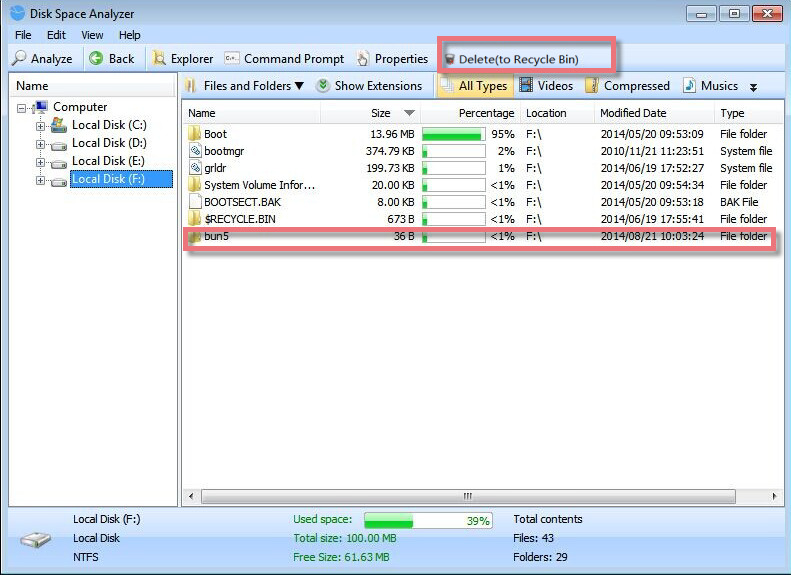 Disk Space Analyzer can scan all parts of a disk, analyzing a large number of the files. It offers a quick and effective way to analyze the files from local disks or folders and will show you a list of files on the drive. Just click "Analyze" and a box will pop up, which allows you to choose all drives or individual drives or a folder you want to analyze, and then click on "OK" button, all kinds of files will be showed at once. After analyzing the local drives, you can see how the data occupies your hard disk. By using Disk Space Analyzer, you can easily organize your data and quickly free up additional space on your disk when needed. Just select the Drive or folder to see which files are taking up the most of your hard drive space. Then choose the useless files you want to delete, click "Delete(to Recycle Bin)" to remove the unneeded files from your disk. Disk Space Analyzer allows you to integrate itself into Windows Explorer Context Menu. 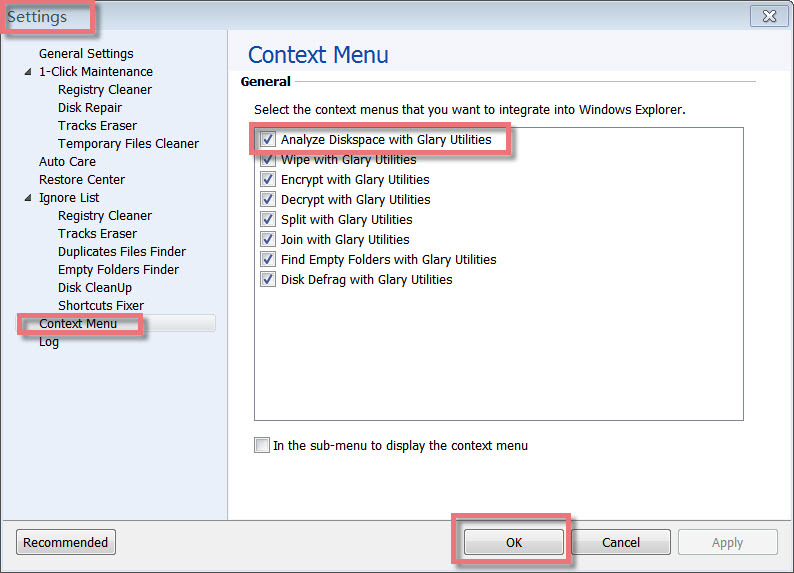 You can open Glary Utilities, go to "Menu", choose "Settings", click on "Context Menu" and check "Analyze Diskspace with Glary Utilities" option. Finally click "OK" at the bottom of the page. Start Disk Space Analyzer. Select the drive(s) or a folder you want 'Analyze' to analyze, then click 'OK'. The left upper pane shows all disks on your PC. When you click it, all files will be showed at the right pane if you have analyzed the disk. You can view at a glance all the subfolders, files inside parent folders by clicking icon. The right upper pane shows the types of files, their size, percentage and total number of files of a particular extension in the analyzed drive/folder. You can quickly filter the specified file type in the current list, such as video, music, documents, image, files compressed. When you click a extension, the bottom list will shows all the files of this extension. You can also use the right click popup menu to find more information. The bottom pane shows you the number of all files and its attributes in the analyzed drive/folder. Click "Explore disks " under Disk Space, Disk Space Analyzer will pop up. 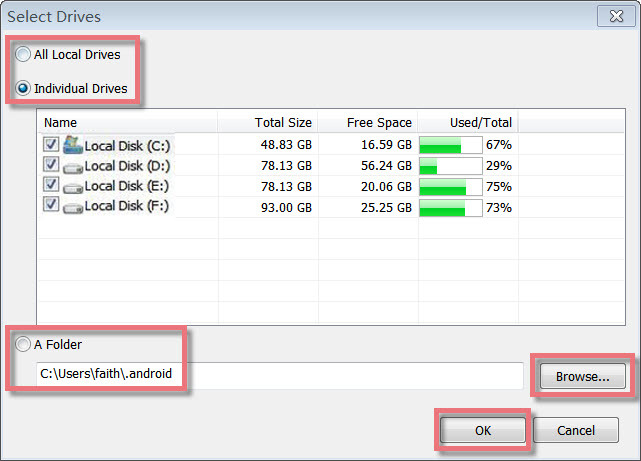 Find and click Disk Space Analyzer icon, Disk Space Analyzer will appear. Please note: if you want to add Disk Space Analyzer in the Dock bar, click in Dock bar, remove any icon by dragging it out of the Dock firstly, and then drag Disk Space Analyzer in.